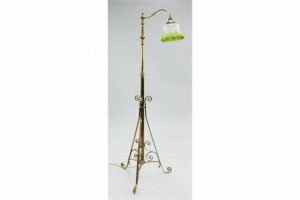 An Edwardian copper and brass adjustable standard lamp, with single scrolling branch, with green tinted crimped glass shade. 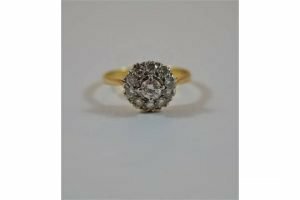 An eleven stone diamond cluster ring, stamped ’18ct’, the central brilliant cut of approximately 0.2 carats, enclosed by eight brilliant cuts totalling approximately 0.4 carats. 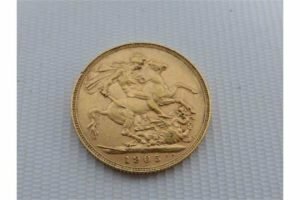 George V full gold sovereign coin. 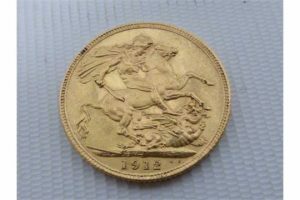 Edward VII 1905 full gold sovereign coin. 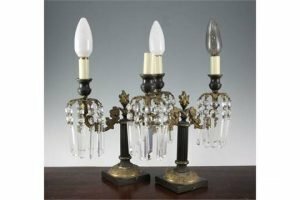 A pair of Victorian painted bronze and ormolu twin branch table lustres, with prismatic drops and fluted columns, now fitted for electricity. 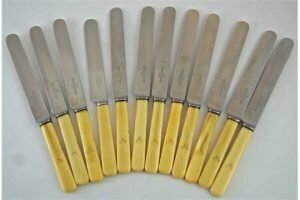 A set of twelve early 20th century knives, with ivory handles and stainless steel blades, by Joseph Rodgers & Sons, Cutlers to HIs Majesty. 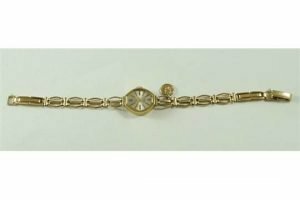 A lady’s Rotary 9ct gold bracelet watch, with a small Saint Christopher pendant attached, 8.2 g gross. 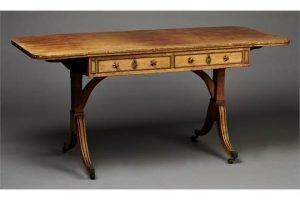 A Regency rosewood sofa table, with overall applied gilt metal beaded borders, the frieze fitted with two drawers with applied anthemion escutcheons and six-point star handle plates opposing similarly decorated dummy drawers, the twin supports raised on downswept sabre legs terminating in brass caps and castors. 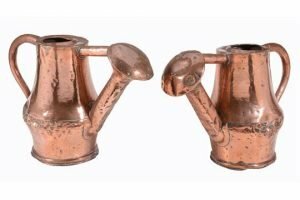 A pair of copper watering cans, probably French, late 18th / early 19th century, each with perforated rose extending from a baluster body, with horizontal support bars connecting with the rims, with loop handles behind. 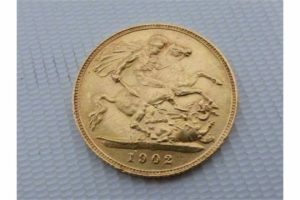 Edward VII 1902 half gold sovereign coin. 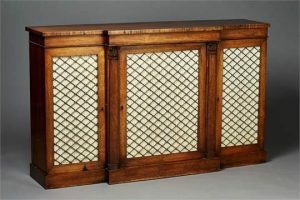 A Regency rosewood breakfront library bookcase, fitted with three doors inset with gilt brass flower-embellished lattice panels, the two pilasters with carved acanthus leaf capitals, raised on a plinth base. 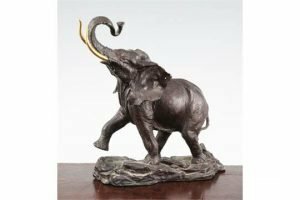 A 20th century patinated bronze elephant, with gilt brass tusks, monogramed FM. 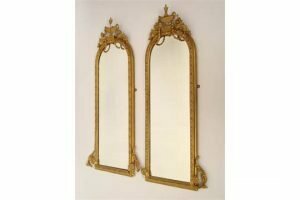 A pair of late Victorian gilt gesso arched rectangular pier glasses, with ovolo and beaded moulded border, the crest surmounted by an urn and draped husk, swags. 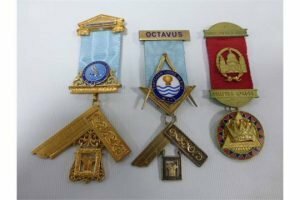 Three Masonic Jewels, to include one 9ct, engraved ‘Presented to W. Bro. Thomas S Long PM by Morland Lodge No.3066 In recognition of a most successful year as Master 1975-76’, 46.5g, and one silver. 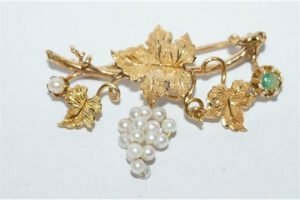 A fruiting vine cultured pearl and emerald brooch, with a drop of small pearl ‘grapes’ with a pearl at one end of the vine and an emerald to the other. 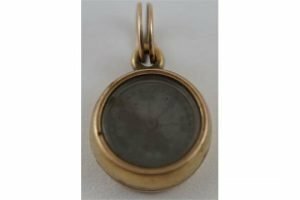 A Victorian compass locket fob, the glazed compass with a hinged back, inscribed ‘Norman’, opening to reveal a hair locket. 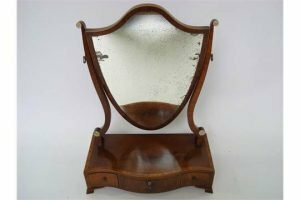 A George III mahogany swing toilet mirror, the shield shape mirror with original plate on scroll supports with applied turned bone roundels, above tulipwood crossbanded serpentine base with three drawers, on ogee bracket feet. 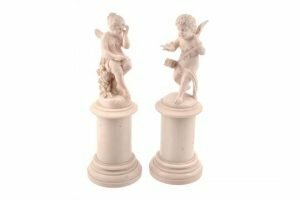 A pair of Dieppe sculpted ivory models of amorini, late 19th century, the Cupid portrayed proffering a billet-doux in his right hand, his quiver slung across his left shoulder, the female portrayed as seated on a flower adorned stump, both on cylindrical pedestals with waisted bases. 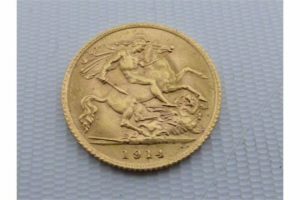 George V 1914 half gold sovereign coin. 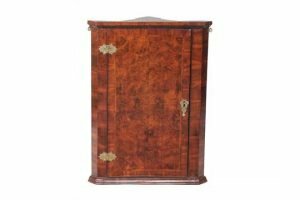 A George II burr walnut and feather banded hanging corner cupboard, circa 1740, the quarter veneered feather and crossbanded door opening to a shelved interior.